We are pleased to offer the Stamp Quarter for Sale! 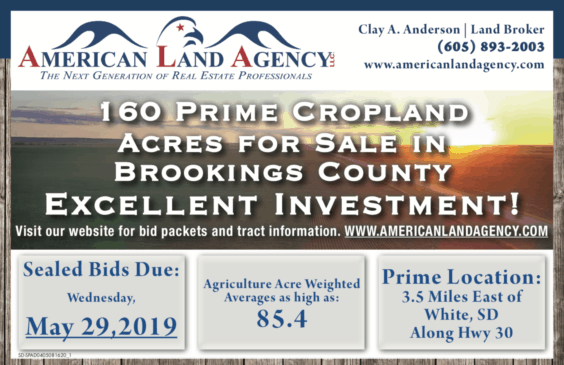 These 160 taxable acres contain tillable acres located Northeast of Brookings or 3.5 miles East of White, South Dakota. This land has excellent access via Highway 30. This property possesses a county average parcel rating of 0.854. 2018 Property Taxes $4,590.10. Legal Description: The Southeast Quarter (SE1/4) of Section Three (3) in Township One Hundred Eleven (111) North, Range Forty-eight (48), West of the 5th P.M., Brookings County, South Dakota less easements, reservations and rights of way of record. Property Features: – The land has been meticulously taken care of with proper farming practices. – Crop rotation chart shows an active rotation. – These acres contain dense and productive soils. – Exceptional lease return, all of 2019 will be received by buyer (lease information in bid packet). – Drain tile installed (see map in bid packet). – Located right next to Highway 30. These acres will make an excellent addition to your current farming operation or investment portfolio! Auction: All offers will be due by 3:00 P.M. CST on Wednesday May 29th, 2019, at the American Land Agency, LLC office located at 103 W 3rd Street / P.O. Box 45, Miller, SD 57362. Final Private Auction will be held at 1:00 P.M. on June 4th, 2019 at the McCrory Gardens, 631 22nd Avenue, Brookings, SD. For more information, please view the bid packet form, with the attached information/easements. Call (605) 893-2003 for more information.